Since April 2016 employers have been able to to utilise a new (voluntary) HMRC online service – ‘Payrolling Benefits in Kind (PBIK)’, which changes the way in which expenses and benefits are taxed and reported to HMRC. HMRC guide Payrolling Benefits in Kind gives detailed information about this new service. The new PBIK service is entirely voluntary – employers can if they wish continue to report expenses and benefits in the traditional (P11d) way. Employers can register to payroll benefits by logging on to HMRC using their User ID and Password. Benefits that are registered as PBIK do not go on a form P11d, whereas benefits not registered for PBIK still need to go on P11d. Employers can choose which benefits they wish to payroll, although some benefits (i.e. vouchers and credit cards, living accommodation and interest free and low interest beneficial loans) still need to be reported to HMRC via the existing P11d system. Employers must still file a P11dB at year end, regardless of whether they are payrolling benefits or submitting them on forms P11d. Employers that choose to payroll company car benefits must no longer submit form P46(Car) when providing an employee with a new car. When an employer registers for PBIK the applicable benefits will be removed from an employees tax code. The employee will be issued with an amended tax code to reflect this change. Once a tax year has started the employer must continue to payroll all PBIK registered benefits for the remainder of that tax year. To ‘payroll’ a benefit the ‘cash equivalent’ of that benefit should be calculated (Payroll Manager does this), and then split across the tax year as applicable. Tax is then charged on each payrolled benefit and is reported in the FPS for that period. From April 2017 onwards, details of cars that have been included in the PBIK system are included in the Full Payment Submission (FPS). 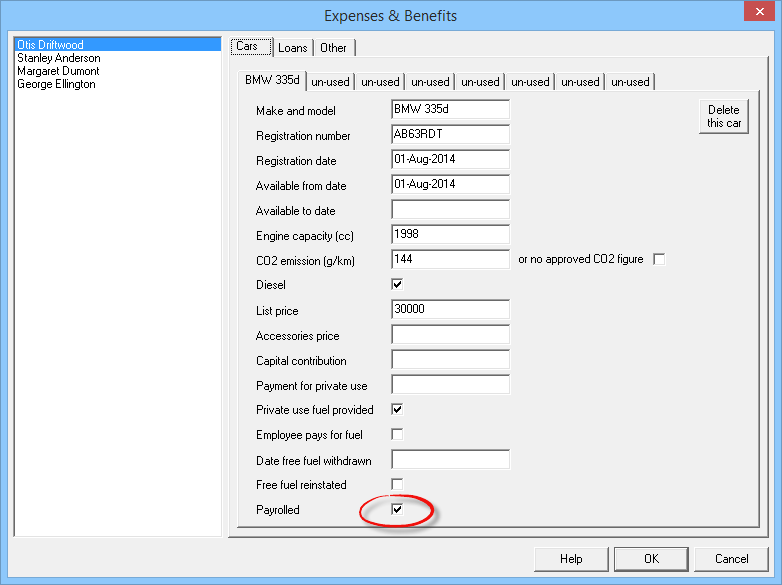 Enter details of expenses and benefits as normal within Payroll Manager. Click ‘Employees’ and then ‘Expenses & Benefits’ from the main menu and enter the relevant information. For more detailed information about Car benefits see our Expenses and Benefits – Cars guide. For each benefit type that you have chosen to payroll you must tick the box marked ‘Payrolled’ at the bottom of each section. Leave the box unticked if you are not payrolling this benefit and wish to report it on the P11d. Click ‘OK’ when finished. 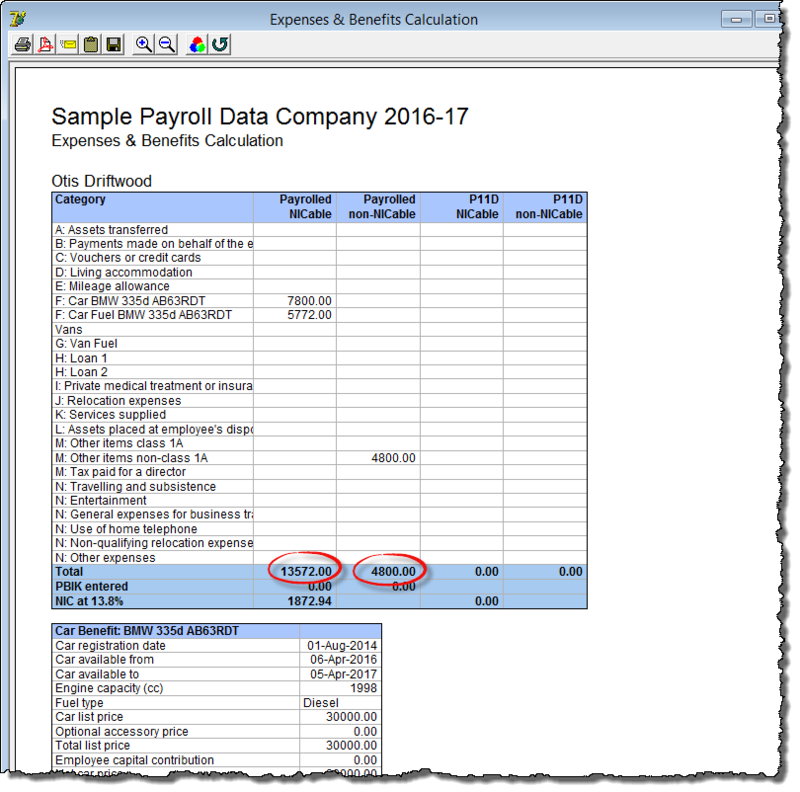 Payroll Manager is able to calculate the ‘cash equivalent’ value of certain types of benefit from the information that you have entered. 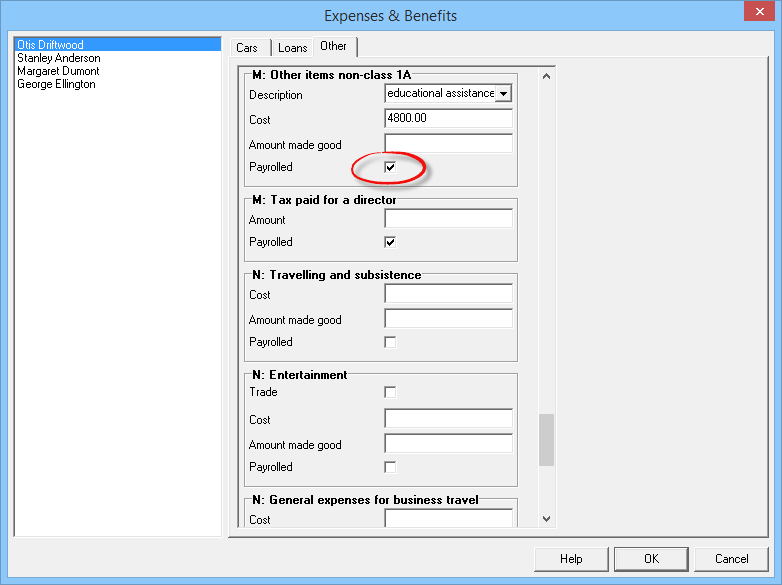 Click ‘Analysis’ and then ‘Expenses and Benefits Calculation’ from the main menu, and select the relevant employee to view this calculation. The report gives details of the benefits that you have chosen to payroll together with their cash equivalents for the year. The figures at the bottom show the total value of benefits that are subject to class 1A employers NIC and the total value of benefits that are not subject to class 1A employers NIC. HMRC require that you report these figures separately on the RTI return. You should make a note of these two figures before closing the report (you may wish to print the report at this stage). 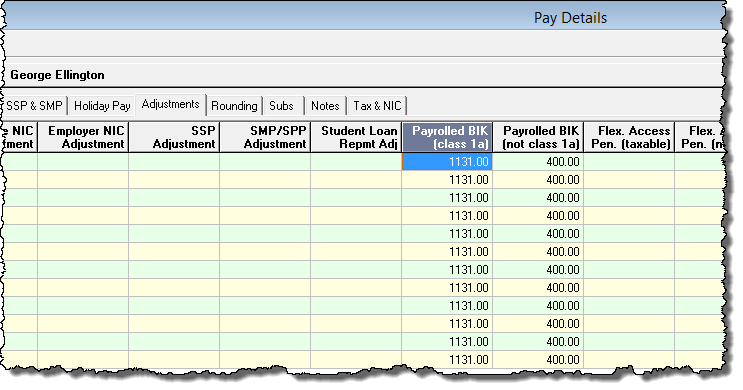 Go to the ‘Pay Details’ screen, select the relevant employee, and click on the ‘Adjustments’ tab. Typically, if a benefit is available for the whole year, you would divide the total amount of the benefit by the number of pay periods in the year before manually entering the result into each pay period in the relevant column (i.e. those marked either ‘Payrolled BIK (class 1a)’ or ‘Payrolled BIK (not class 1a)). In the example above, the total benefit of car and fuel for the year is £13572. This benefit type is subject to class 1A NIC, and is broken down into 12 equal amounts of £1131 per month. The ‘educational assistance’ benefit is not subject to class 1A NIC, and the annual amount of £4800 is broken down into 12 equal amounts of £400 per month. For other examples and detailed guidance on how to deal with more complicated situations please refer to the HMRC guide Payrolling Benefits in Kind. After entering the PBIK amounts on the adjustments screen you could if you wish reproduce the ‘Analysis – Expenses & Benefits Calculation’ report to check that you have entered the figures correctly. This report shows both the calculated (Total) figure and the PBIK entered figure, which should be the same. 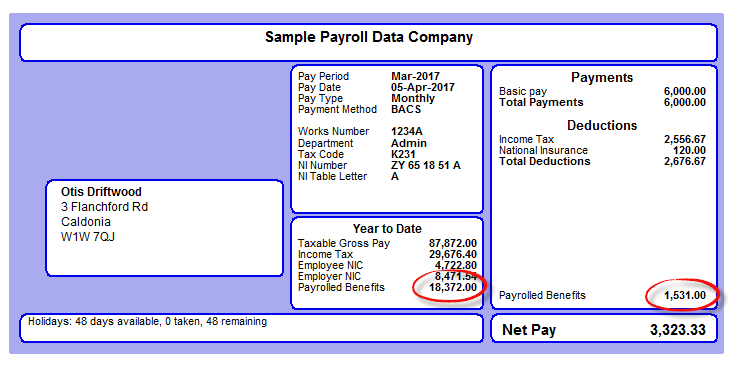 Payrolled benefits will appear on an employee’s payslip as a separate item. The ‘cash equivalent’ is also included in the P60 at year-end as part of the ‘total taxable pay in the year’ and included in any P45 in the ‘total taxable pay to date’ field. Following the end of the tax year, the employer must issue each employee that has had some or all of their benefits payrolled with a statement giving details of each PBIK. 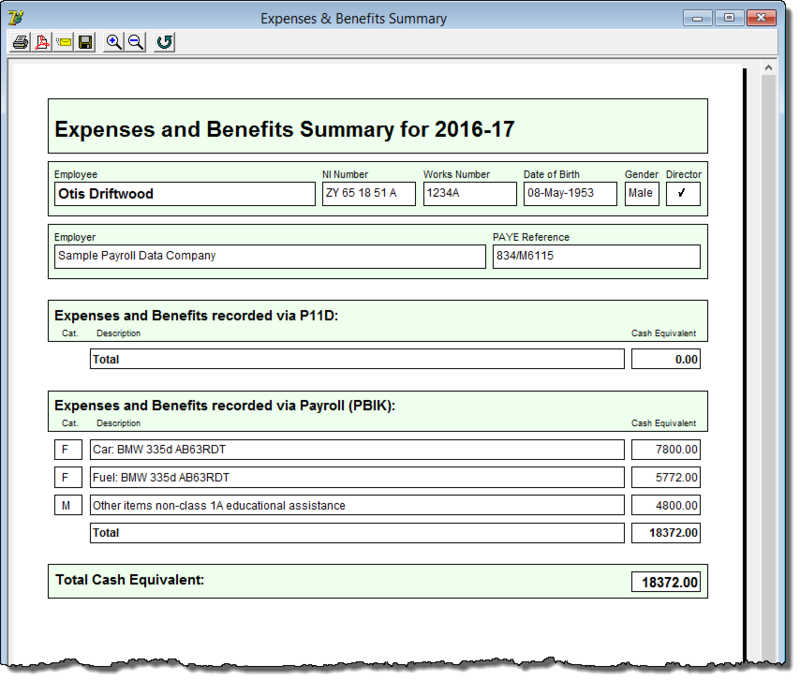 Click ‘Forms – Expenses & Benefits Summary’ from the main menu in Payroll Manager to produce this report. If an employee only has expenses and benefits that have not been payrolled then they should be issued with a P11d as usual. Such P11d forms will only contain details of benefits that have not been marked as being payrolled. The employer is still required to submit return P11dB before 1 July following the end of each tax year, regardless of whether benefits have been payrolled or not. Click ‘Forms’ then ‘Employers Declaration P11d(B)’ to produce this report. For guidance on what do when an employee leaves, or if the value of their benefit changes mid-year, along with other examples, please refer to HMRC Payrolling Benefits in Kind web page.